When renting a film, the most you usually hope for is that the movie is good. 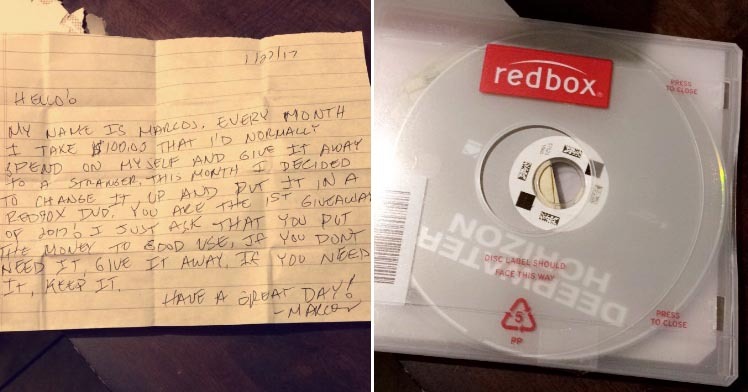 However, one lucky woman recently got a lot more than that when she opened a rented DVD to find, included inside the casing, a pleasantly surprising gift of $100 from a kind stranger. Not so mysterious after all! The woman's daughter, a nursing student called Liz, took to Twitter to share news of the gift, which was accompanied by a handwritten note from the mystery benefactor. In that note, he explained: "Hello! My name is Marcos. Every month I take $100 that I'd normally spend on myself and give it away to a stranger. This month I decided to change it up and put it in a Redbox DVD." Calling the recipient "the first giveaway of 2017", he added: "I just ask that you put the money to good use; if you don't need it, give it away. If you do need it, keep it. Have a great day!" Liz's tweet quickly went viral; at the time of writing, it has been retweeted 29,000 times and attracted 91,000 likes. Many tweeters commented positively about Marcos's generosity, though attracting so much attention on Twitter clearly wasn't something that Liz was quite prepared for. While trending in Houston, the United States' fourth-largest city, had been beyond her expectations, she was probably even more surprised when the benefactor tweeted her to reveal his full identity. @lifeaslizz__ @redbox The internet is a small world! My niece saw your tweet in her feed and sent it to me. Glad I made your mom's day! Yes, it turns out that this is the man himself; relatives seem to have confirmed so on Twitter, while Marcos posted his own photo of the same handwritten letter, thereby confirming his veracity. To be more exact, he shared a screenshot on his Facebook account of a status update in which he had earlier reported his intention to put the money and letter in the DVD case. Liz's mother had got the DVD from Redbox, a company that allows DVDs, Blu-ray discs and video games to be rented through automated retail kiosks at various outlets - including convenience stores, food stores, mass retailers, fast food restaurants and pharmacies - in the United States. That's not the only story of heart-warming generosity that has emerged recently. In a story told by TheLADbible, student Luke Jay Mumford noticed many homeless people in Canterbury, where he was attending university. As temperatures cooled, he started a habit of buying a hot drink for one of these people each morning he travelled to university. At one point, after providing one of these routine hot drinks, a man called Carey, who owns the Canterbury-based Historic Boat tours, approached the nice lad, thanked him for his kindness and offered him a job at his company. Luke decided to turn down the offer, remaining content with the progress that he was already making working for Sainsbury's. Still, as he recalled later, "we did start discussing possible graphic design work experience as part of my course - which I am excited to begin." A great example of karma in action. We wish you very well in your studies, Luke.